This method requires walking along a known distance, then dividing that distance by the total number of steps you took to complete it. The actual distance doesn't really matter—just so long as you already know how long of a distance it is. For most people, you can use the track at a local school which is usually 1/4-mile (1,320 feet), or 15,840 inches) in length. A football field, from goal line to goal line, is 300 feet (3,600 inches). The bases of a baseball field should be 90 feet (1,080 feet) apart from each other. Many walking and bike paths are marked with distance markers that could also be used for this purpose. So walk the distance, then divide the known distance by the number of steps it took you to cover that distance. It wouldn't hurt to try this several times to make sure you're getting consistent results. If you aren't, replace your pedometer. This option is probably the easiest for most people—practically every school has a 1/4-mile track readily available, although you'll have to hit it when school is out of session and nobody else is using the field. Each 1/4-mile lap is 15,840 inches (0.25 miles x 5,280 feet/mile x 12 inches/foot). My stride, in each case, is very consistent with less than an inch between each measurement. It averaged just over 36.5 inches. Pedometers don't usually allow fractional strides, but a half inch, plus or minus, isn't going to matter much, so round it off to the nearest full inch. In my case, I'd round off to 37 inches. 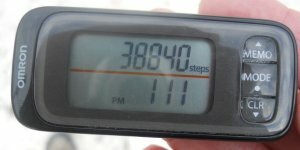 Using your pedometer to count steps has one significant advantage that I alluded to easlier: it incorporates any 'quirks' in your pedometer's counts. Especially so for mechanical pedometers which often count low or count high depending on how stiff or loose they are. Even if the step count isn't entirely accurate, it can still measure a very accurate distance! 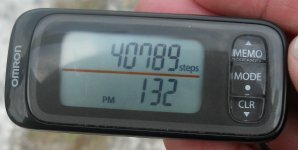 Take a theoretical pedometer that has a tendency to count three steps every time you really take two steps. It's over-counting your steps by 50%, so on a 1/4-mile track, you might actually take 450 steps, but it'll record 675 steps. That's a big difference, and is the difference between a stride of 35 inches and a stride of 24 inches! But if you set your pedometer to 24 inches, it'll still measure distances you travel accurately—even if the step count is actually wrong! The Florida Keys Trail largely follows US Highway 1 from Key West to Key Largo with mile markers along the entire route. So I took a series of photos along my walk of each mile marker and my step count. Since I measure my stride in inches, first I calculate how many inches is in one mile: 63,360 (1 mile x 5,280 feet/mile x 12 inches/foot) Remember this number—I'll be using it to calculate my stride in inches. I used MM 18 as the starting point for measuring my stride, at which point my pedometer had already counted 37,012 steps for the day. I'll have to subtract my step count at the finish from my step count at the start to get the number of steps between the two mile markers. After a mile, my step count had increased 1,828 steps. Divide the distance (63,360 inches) by my step count (1,828) and my stride measures out to 34.7 inches. After another mile, my step count had increased an additional 1,949 steps. Divide the distance (63,360 inches) by my step count (1,949) and my stride measures out to 32.5 inches. There are a couple of things I'd like to point out about these numbers—they're my actual walking numbers. They include stops to rest, or chasing around after birds or iguanas to get photos of them. I crossed back and forth across Highway 1 for safety reasons or just to get a photo of something on the 'wrong' side of the road. So although I covered one full mile between each point, actual miles traveled is probably a bit higher. But that's okay—that's how I walk! And it explains why my stride isn't necessarily consistent from mile to mile. Over time, they'll average out, and for this two-mile segment, I'd use a step count that's halfway between 32.5 and 34.7 inches: 33.6 inches. Pros: Calibrates the pedometer you use—and even compensating for whatever quirks it might have. It can be relatively quick to measure—perhaps 10 to 15 minutes on a track. Cons: You need to find a location with a known distance such a track, football field or bike path (or road) with mile markers. Suggested Use: For most people who take short walks throughout the day—not much more than around the block—this will likely generate the best stride measurement for your walking purposes.